The dominance of Google notices in our dataset limits our ability to draw broader conclusions about the notice ecosystem. Google has characteristics that set it apart from many other services, including the use of form notices, automated triage systems, and a “trusted sender” program. Google’s dominant position in search and the extraordinary number of notices it receives also make it unusual. 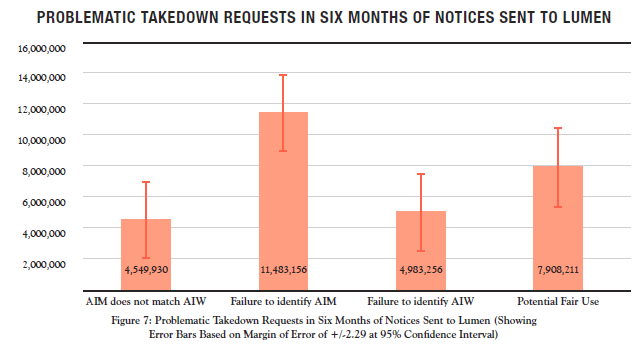 This makes the Lumen dataset useful for studying an important part of the takedown system, 215 but also means that the characteristics of these notices cannot be extrapolated to the entire world of notice sending. Details, details. But sadly that won't stop Mike from extrapolating to the entire world of notice sending. Such stretches of reality are his bread and butter.